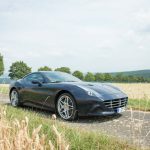 For the first time since GTspirit was founded nine years ago we received an invite from Ferrari to test one of their latest creations: the Ferrari California T. Curious to see if it lives up to our expectations we accepted Ferrari’s invitation and took the California T out for a spin in Frankfurt. 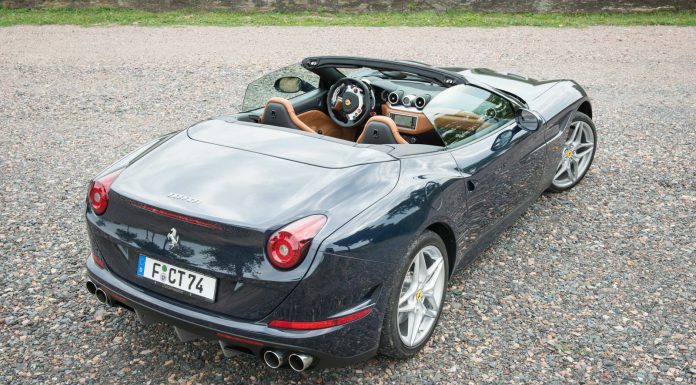 The Ferrari California T is a 2+2 GT convertible and successor to the 2009 Ferrari California. 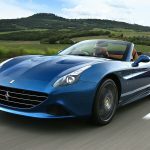 Its name is a reference to the legendary Ferrari California models of the 1950s and 60s. 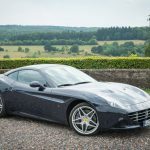 The California is not just popular with people living under the Californian sun but it also sells well in the rest of the world with about one third of the models going to the US, one third staying in Europe and another third making its way to Asia. Under the front bonnet a new 3.9 liter Ferrari bi-turbo V8 engine forms the heart of the new California T. The California T, T standing for Turbo, features variable boost management delivering different torque levels in different gears. A clever bit of tech that provides more torque in higher and longer gears giving a sensation of continuous acceleration. The new setup also eliminated turbo lag nearly completely. 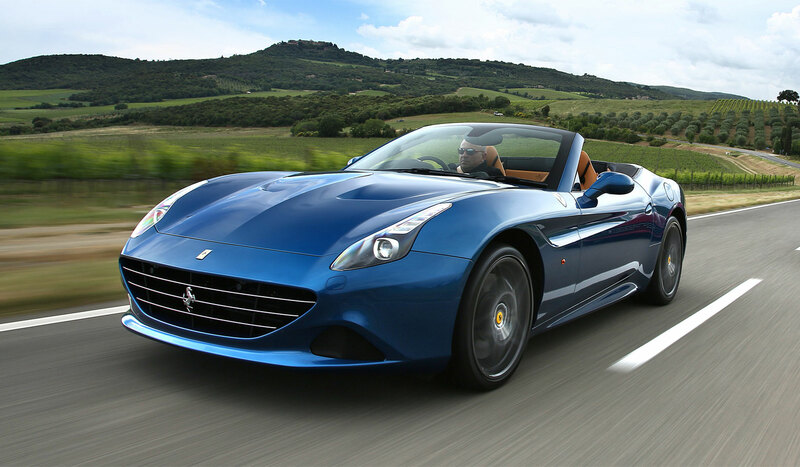 Performance wise the Ferrari California T’s V8 turbocharged engine provides 560hp and up to 755Nm of torque. This allows the California T to sprint from 0-100 km/h in 3.6 seconds, 0-200 km/h in 11.2 seconds and a top speed of 316 km/h. Compared to its predecessor its 0.2 sec faster to 100 km/h and over 2.5 seconds faster to 200 km/h. 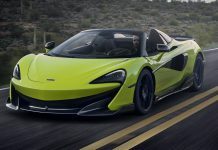 Top speed remained about the same, as did the weight but thanks to increased power the power-to-weight ratio improved from 3.3 kg/hp to 2.9kg/hp and at the same time fuel consumption and emissions dropped by 15%. Besides the engine there are more elements that sets the California T apart from its predecessor, most obvious is the new design. A F12 inspired front featuring significantly larger air intakes for the brakes and intercooler and two new air exhausts in the bonnet. Along the side the sweeping lines inspired by the 250 Testa Rossa remain intact. The rear features new horizontally aligned exhaust compared to the vertically aligned exhaust of its predecessor. The triple fence diffuser is very similar to that from the 599 GTO. The rear lights are slightly larger and give the rear a dominant stance. 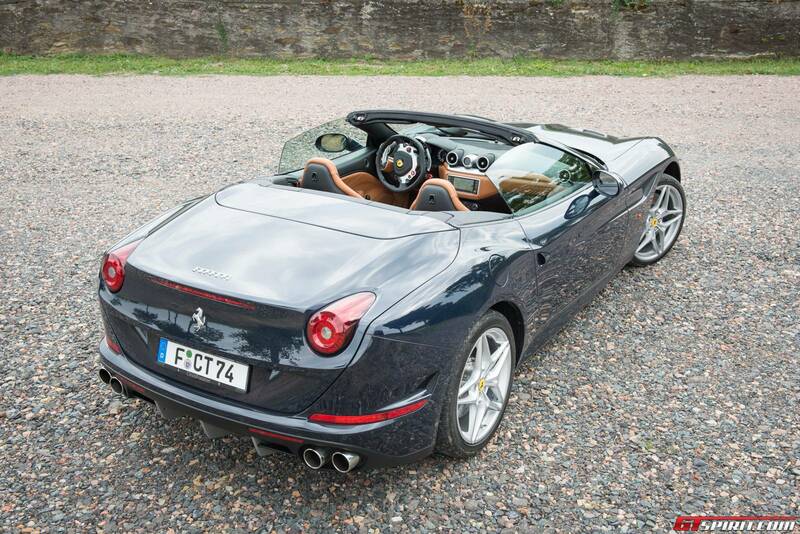 The Ferrari California is often used on a daily basis and driven a lot more than other Ferraris. So it was important to raise the level of practicality of the California T. The new rear has a lower and wider boot and with the roof down it fits two standard hand luggage suitcases. With the roof up you can fit one more suitcase. 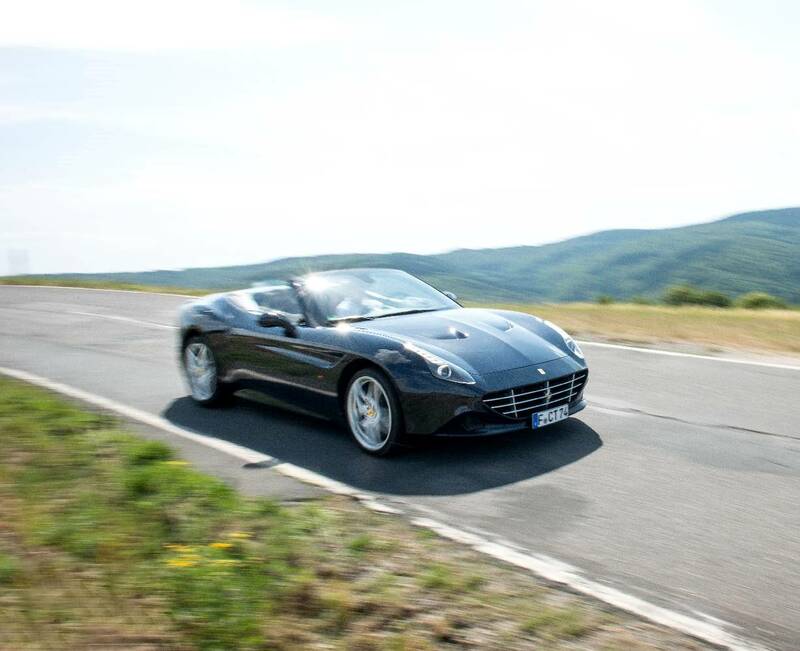 New on the Ferrari California T are composite brake pads in addition to the ceramic discs. These not only provide additional stopping power but also warrant a longer lifecycle for the brakes. During our test drive they performed excellent, the only downside of the huge stopping power is that the emergency stop signal came on a few times while braking for a corner. With the basics out of the way it is time for our test drive. 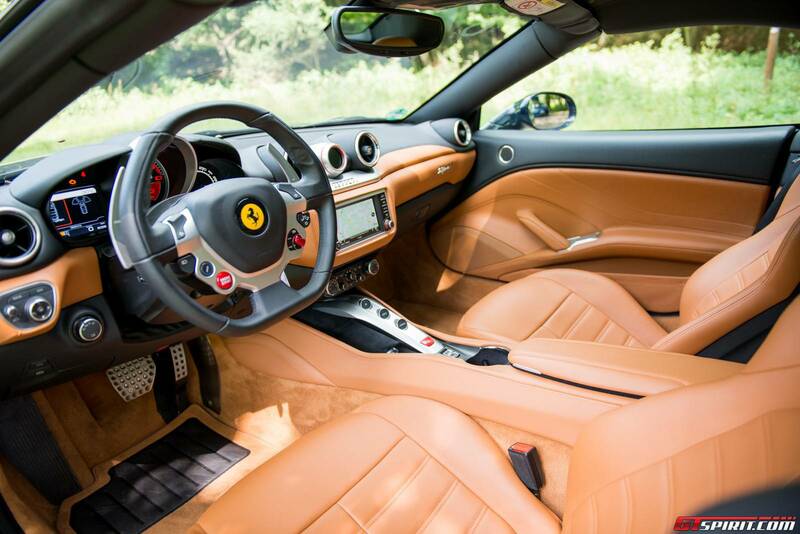 The Ferrari California T still comes with an old school key that you slide in the contact and turn before pressing the start button on the steering wheel. 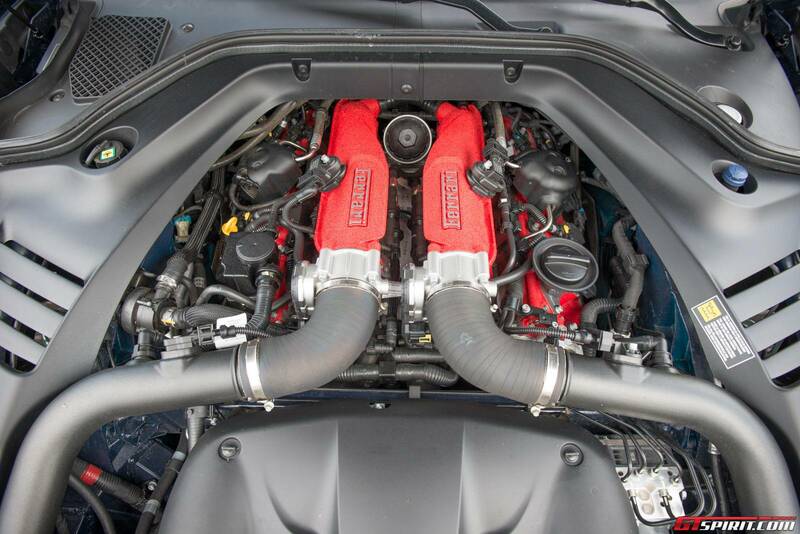 The turbocharged V8 comes to life with a tone not untypical for Ferrari. 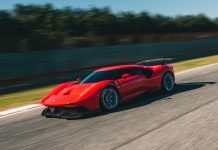 In general Ferrari put a lot of effort in to making the new turbocharged engine sound and behave as much as possible as the naturally aspirated V8s, with the upside of more power, more torque and better efficiency. My first impression of the interior is great. For an Italian car there is a lot of space and the interior design is quite beautiful. All exposed parts are covered in the finest leather and the seats provide both support and comfort – a rare experience for someone who is 1.90m tall. The slim lower part of the center console features the key switches for the gearbox; auto, reverse and launch control as well as the emergency indicators and the window switches. The slim and low design of this center console gives the car a very spacious feel and leaves enough room for my legs. Above the center console are the climate controls, two-zone and very straight forward. The center piece is the infotainment system touch screen with quick access buttons for all key features. 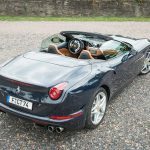 The Ferrari California T is one of the first cars to feature Apple CarPlay and despite its limited functionality (Apple only supports a handful of apps at the moment) it works very well in the California T. Digital radio (DAB) and navigation were also available on our test car. Although we are not a fan of touch screens the only thing that really annoyed us was that you had to press the zoom button first before you can use the right knob to zoom the navigation map in and out. It was one of the hottest days of the year in Germany with temperatures above the 30 degree mark. The California T being a convertible I immediately pulled the switch to drop the roof. This can only be done while completely standing still – a bit of a downside compared to some of the competitors who can open and close the roof while driving. It’s technically possible but Ferrari made the decision to disable it while driving for safety reasons. With the roof down we made our way to the nearby autobahn. One of the great things about Germany is the presence of some pristine stretches of unlimited autobahn where you can test cars like this at higher speeds as well. Accelerating onto the autobahn the California T feels very well at home. It is stable and comfortable and the car kept pulling through the gears effortlessly. With the roof down and me being to lazy to mount the wind deflector things got a bit loud above 200 km/h but the turbulence in the cabin was still surprisingly light. I make a quick stop at an autobahn petrol station to close the roof and try the same again, this time with the roof up. The hard top is very quiet and it is a very pleasant car for a fast autobahn drive. At higher speeds it is more stable than many sportscars. The controls on the steering wheel, especially the indicator buttons, took me a while to get used to them although the next day it was hard to switch back to normal ones. The Manettino has three options; Comfort, Sport and ESC Off. In all modes the California T is still first of all a Ferrari and in the second place a GT car. It feels like a proper sportscar in Comfort already. Switching to Sport will improve throttle responds and change the gearbox behavior, ESC will allow for little drifts, ABS is set to high performance and the suspension will get harder. With the suspension button on the steering wheel you can switch back to softer suspension if needed. In ESC Off the stability and traction control are switched off. Ideal for some track fun and burning rubber. We left the autobahn behind us and found some nice twisty roads in the valleys along the Rhine. Like in the autobahn the California T feels extremely well connected and stable. Swinging from corner to corner it reacts to steering inputs exactly the way we wanted it to. The double clutch 7-speed automatic gearbox is very fast and very well programmed. But my craving to use the paddles is stronger so I ended up shifting most of the time. The long aluminum paddles are mounted in a fixed position directly behind the steering wheel – pulling them makes a solid click. Despite the turbocharged V8 the sound is still very Ferrari-like. It might not reach the high pitch volume of the naturally aspirated engine but it still sounds unmistakably like a Ferrari. The switch to turbocharged engines was quite controversial but even for Ferrari it is the way forward. 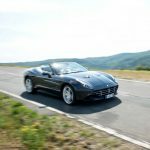 Competitors of the new Ferrari California T include the Bentley Continental GT V8, Mercedes-Benz SL and Porsche 911 Turbo Convertible. In comparison the California T is certainly the sportiest and most exotic of the bunch. It also has the nicest interior. The Porsche 911 Turbo Convertible is slightly faster and better in all weather conditions thanks to all-wheel drive. The Bentley offers more comfort and space and the Mercedes-Benz SL can be more of a hooligan. But overall the California T is a top contender in this segment. 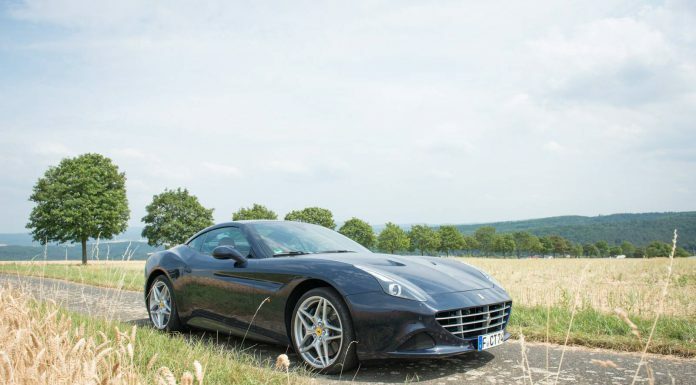 The Ferrari California T was a real surprise and it wasn’t what I was expecting at all. The California T is far more sportscar than GT, yet at the same time ticks all the boxes to serve as a GT or daily driver. I particularly enjoyed the spacious and luxurious interior, the new V8 engine with its enormous peak torque and the planted feeling of the California T. It is a very good all-round car that doesn’t compromise whether you drive on winding country roads or unlimited autobahn. Was there anything I didn’t like? The new front and rear design look great, but the swinging Testarossa inspired side design is not really mine. And two minor things I did miss; a dedicated button to zoom the navigation map in / out and keyless entry / keyless go. 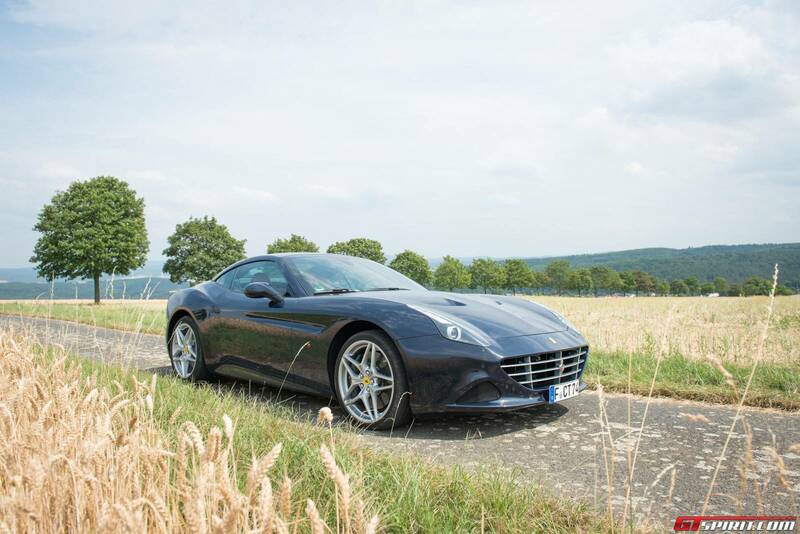 The Ferrari California T was a real surprise and it wasn't what I was expecting at all. 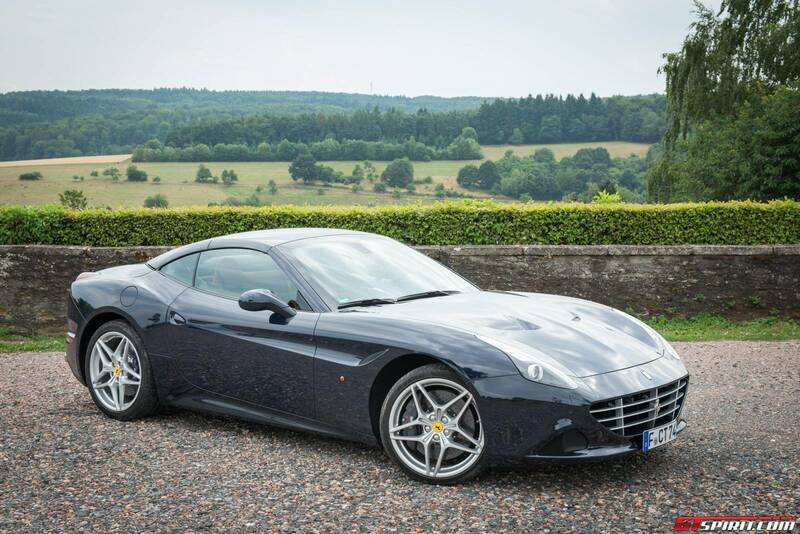 The California T is far more sportscar than GT, yet at the same time ticks all the boxes to serve as a GT or daily driver. I particularly enjoyed the spacious and luxurious interior, the new V8 engine with its enormous peak torque and the planted feeling of the California T. It is a very good all-round car that doesn't compromise whether you drive on winding country roads or unlimited autobahn.